The Library of Congress (LoC) is the national library of the United States. Founded to house documents useful to the Congress, it has become the largest library in the world, with more than 151 million items in 470 languages: more than 34 million books and other printed materials, 3,3 million recordings, 13 million photos, 5,4 million maps, and 66 million manuscripts. The Online Catalog collects more than 14 million records, which can be freely searched by the main catalogue headings: title, author, subject and keywords, thus providing the most comprehensive online archive of basic bibliographic info worldwide. Other major electronic services include: the American Memory Project which stores historical maps, photos, audios and videos; the Online Exhibitions guiding users into LoC galleries through virtual tours; the Global Gateway which is an international collection of e-resources on world culture; and THOMAS, the official entry point to legislative infos. Through the LoC website full texts of a huge amount of material are available for free in various formats. In some special collections, digital reproduction and description of the most rare works (manuscripts, maps, etc.) are also freely available. For some kinds of records an institutional affiliation is required. 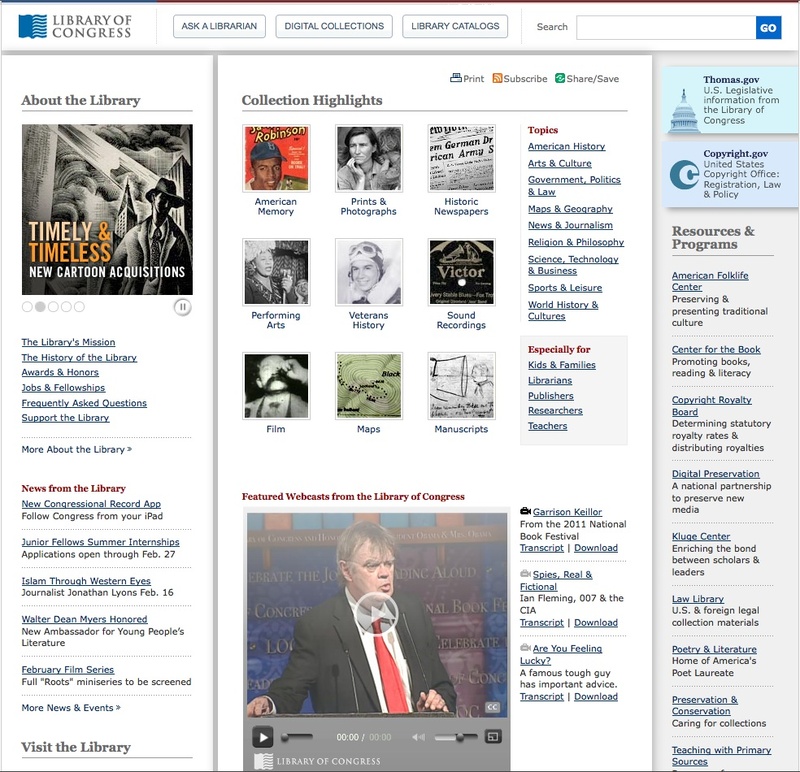 The website gives links to many other libraries and resources websites in the world, selected and ordered by sections.